U.S. Presidential Retreat, Camp David, Is Named After? Maps That Are Geometrically Distorted To Display Related Data Are Called? The U.S. Presidential retreat located in the Catoctin Mountain Park near Thurmont, Maryland is officially known as Naval Support Facility Thurmont and is staffed and guarded by a mixture of Naval, Marine, and Secret Service personnel. Informally, it’s known the world over as Camp David, a scenic retreat used by U.S. Presidents dating back to Franklin D. Roosevelt and made internationally famous in its role in the 1978 Camp David Accords (a negotiation session brokered by then President Jimmy Carter between Egyptian President Anwar al-Sadat and Israeli Prime Minister Menachem Begin). But why Camp David? Why not call it Retreat One, Camp Thurmont, or just The Lodge in the fashion we refer to the primary Presidential residence as The White House? The location was originally known as Hi-Catoctin and was constructed during the 1930s by the Works Progress Administration (WPA) as a camp site location for federal government agents to go on retreat with their families. In 1942, Roosevelt converted it into a presidential retreat and renamed it “Shangri-La” after the fictional Himalayan paradise. The name stuck until Eisenhower gave it a more down-to-Earth nickname during the 1950s: he renamed it Camp David in a nod to both his grandson (seen in the photo here) and his father. 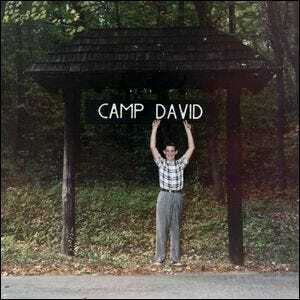 The name stuck and the location has been referred to as Camp David ever since.